Bought a new phone from the 3 store in Coventry city centre today and was really excited. 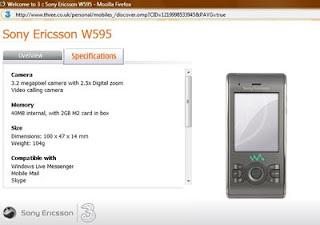 It is the Sony Ericsson W595. It is a slider phone and really looks sleek. The phone is one of the models in their Walkman series and you might have guessed by the name, is targeted at people who use their phones to listen to music. It even has a "share jack”, which allows you to share your favourite songs with a friend by plugging in two sets of headphones. The phone has several features which should appeal to the younger generation. This includes an FM Radio, an innovative "shake control" where you can control various features of the music player by shaking the phone. 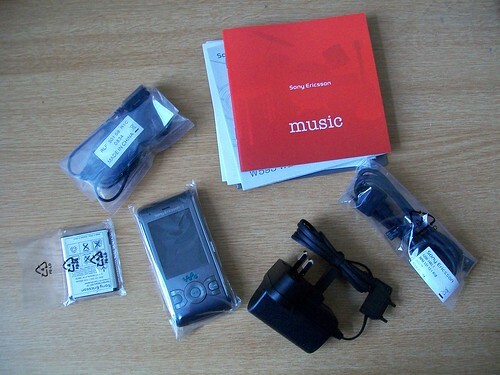 Another feature present on various Sony Ericsson phones is the MusicID system. If you hear a tune and want it on your phone or just want to know the details, you can use MusicID to get the song name, artist and album to your phone within seconds and you can then buy it online. And Yeah! the sound was quite good. The phone has a 40MB memory and also came with a 2GB M2 card (totally free). One of the reasons I bought the phone is that it has a 3.2 megapixel camera with 2.5x Digital zoom and is also a video calling camera. Another reason is that my wife has the Sony Ericsson K660i and after trying it out found out that Sony Ericsson phones are not that bad. 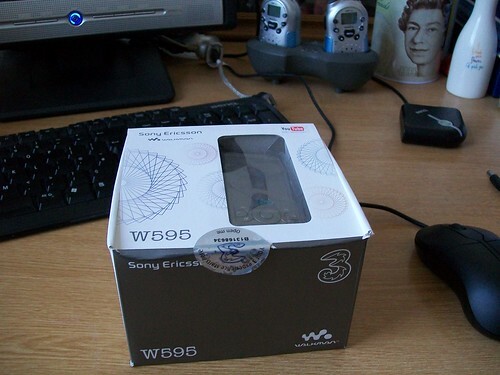 In fact, the W595 is my first Sony Ericsson mobile. Best of all, the phone is very affordable and within my budget - only £2 per month for a 18 month's contract + £15 for their 300 minutes package. When I took the phone out of the box, it took me a while to take off the back cover of the phone so that I could insert the SIM card and the battery. I was scared that I might break it trying to open the cover. The phone did have some shortcomings apart from the ones listed above. First of all, the M2 card slot is inside under the SIM card. It also doesn't' have a flash for the camera. The keys are not soft to the touch as well. However, one major issue that I have with this phone is the fact that Skype is not compatible with this phone. I confirmed this with a customer service guy. I wonder why the 3 website mentions that Skype is compatible with the phone when it clearly isn't. I really like this phone but the main reason I bought it was because I thought it had Skype as well. Now have to find a Skype compatible phone within my budget. Too bad I didn't get the chance to fully try this phone out. the handphone looks really nice...i still use w800i...maybe it's time to get a new phone ! i think u can try skype connectivity on symbian series 60 phones. used to be a sony ericsson user meself, the designs are cool and all but i find the operating system on their phones a bit limiting. For my money this phone is an absolute stunner to look at. My review sample came in a nice shade of blue. Vodafone has a far less attractive looking black version, Three a grey one, and Orange seems to have the blue one available. !! But i still has my 550i. If something happens to mine..then I would like to buy this one. I always use Sony Ericssons because they are easy to use and all of them look nice. I have the k800i but when I get the chance I might be getting one of these unless a better one comes out next year. I did downloaded the Skype software on to the W595, it is okay at first (I can call out), but now the phone keep telling me login error,so that I can not see the contacts, but receive incoming Skype call is still okay, strange. Can anybody twll me that, is this mobile W595 compatible with Microsoft office (word and execell) and how to use it,,,,? please.